This active optical cable (AOC) is fully hot-pluggable and supports 10 Gigabit Ethernet applications connected through SFP+ (Small Form-Factor Pluggable) ports. The AOC cable is lighter and more flexible than SFP+ direct-attach cables which makes it ideal for installation in tight spaces and over longer distances. Designed for high-speed interconnects, this low-power, low-latency optical cable is ideal for applications such as point-to-point in-rack and across-rack network switch or server connections. 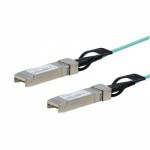 Backed by a StarTech.com 2-year warranty, the SFP10GAOC3M is a reliable replacement cable for the Cisco SFP-10G-AOC3M.